Beginning next year, you’ll have another option for flying between Fort Lauderdale-Hollywood (FLL) and Quito, Ecuador (UIO) – with better connections, of course. JetBlue expects to launch daily service in the first quarter of 2016 with its 150-seat Airbus A320. The airline already offers service to several destinations in South America, including Bogotá, Cartagena and Medellín in Colombia and Lima in Peru. With the upcoming Fort Lauderdale-Quito route, JetBlue is expanding its coverage of popular tourist markets, and further boosting Fort Lauderdale’s status as an important focus city for the airline. Currently, TAME is the only airline to offer non-stop service between FLL and Quito. Currently, your best option for getting from the East Coast to Quito is TAME, Ecuador’s flag carrier. The airline flies non-stop from Fort Lauderdale, while Avianca, Delta, JetBlue and others offer service with a plane change in Bogotá. 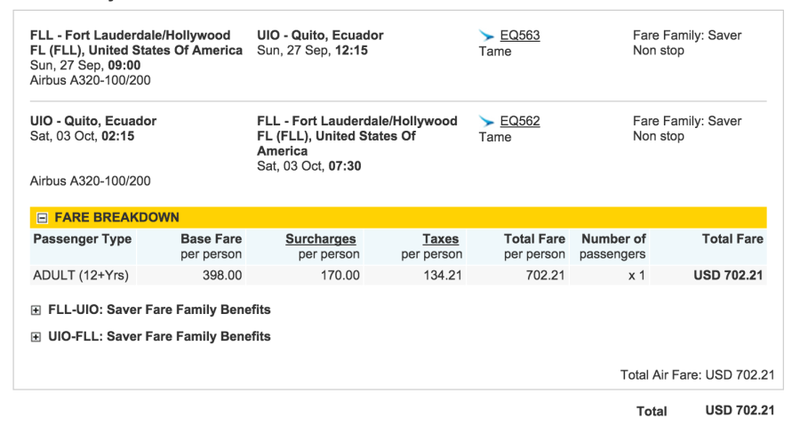 A round-trip ticket on TAME between FLL and Quito currently costs about $700 for travel in late September, and it’s safe to assume that JetBlue will offer competitive fares when it launches the route next year.